It is always a pleasure to witness an entire menu dedicated to healthy eating. Most of us fear eating out just because the food will be either full of junk cooking oils and bottled sauces or too rich even if the ingredients are all real and healthy. 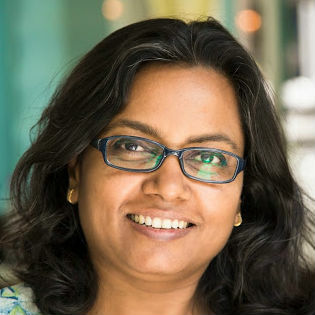 So when I got to know that Chef Neeraj Tyagi (Executive Chef, Shangri-La's Eros Hotel), has created a healthy 'Au Natural' menu to commemorate the Global Wellness month all this June at the award winning Italian restaurant Sorrento, I fixed a date and went to taste a few things from the menu. I must share that the regular menu at the classy Italian restaurant Sorrento is all healthy as I have been there a few times, the ingredients always fresh and real, great quality olive oils and cheeses being the highlight apart from the house grown micro greens and fresh leafy greens. For this Au Natural menu Chef Tyagi took inspiration from the training he got from Michelin Star Chef Florent Biovin which is evident from the decadent refreshing flavours of the ingredients used, the flavour combinations and cooking techniques applied. 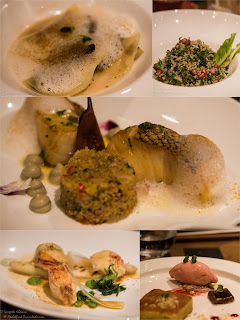 The Potato Ravioli and Pan Seared Chilean Sea Bass that I tasted from the menu actually represent how the food has been treated to bring the best out of the ordinary ingredients. The Quinoa Salad with parsley and pomegranate seeds was the first thing I tried and liked too, but I will suggest you skip this so you can eat the best parts of the menu. The Poached Lobster with grilled white asparagus, green peas and seaweed was an interesting medley of flavours and textures, you can try if you like prwns. The real surprise came when Potato Ravioli with shiitake mushrooms and truffle essence was served. The flavours of the mushrooms enriched with truffle essence was pleasantly potent and the paper thin slice of potato encasing the flour-less ravioli actually a master stroke. I would have preferred the potato casing a bit softer but the idea and the flavours left me wanting for more. This is a must try dish from the menu. Pan Seared Chilean Sea Bass was very well done, served with smoked aubergine puree, pickled aubergine and a quinoa salad, the fish came with a citrus zing that I found quite nice. The pickled aubergine didn't agree with my taste but this dish is a meal in itself and you must order if you are going for this menu and you love fish. I was too full and wanted to skip the dessert but it was interesting to see how the olive oil cake was made so light, served with strawberry sorbet it is a light and flavourful dessert but comes in a big serving so it is better to share it with your partner. A great menu with some very nice elements like the seaweed and pea puree served with Poached Lobster, the smoked aubergine puree served with the Chilean Sea Bass and the light potato consomme served with the Potato Ravioli, is worth the money. So go and enjoy the Au Natural menu now as there are only a couple of days remaining. Some of the dishes will be retained into the Sorrento menu I hope, I vote for Potato Ravioli.